Overwhelming majorities of Americans support deep reductions in carbon dioxide pollution from our power plants and vehicles. But methane pollution during the production, delivery and use of oil and natural gas is an overlooked silent climate threat, dialing up global warming today and pushing us toward irreversible climate tipping points. Tell the EPA: Reducing methane emissions is a significant, largely untapped opportunity to reduce greenhouse emissions quickly and cost-effectively. 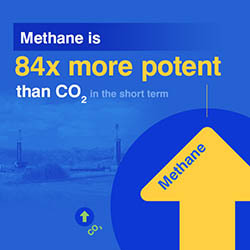 As you're aware, methane is a powerful greenhouse gas, 84 times more potent than carbon dioxide in its first 20 years in the atmosphere, and responsible for 25% of the climate change we're experiencing today. If we have any hope of averting climate catastrophe, it must be addressed. The goal announced by the Obama Administration this past January is a critical first step. But in order to achieve a 45% reduction in methane emissions from the oil and gas industry by 2025, the EPA must propose the strongest possible regulations this summer. I'm writing today to ask you to do just that. Voluntary steps are not enough. The smarter companies are already taking steps to address methane emissions, but the vast majority are not. The EPA needs to propose regulations that make 'best practice' the standard practice. Cost-effective solutions are readily available. An entire industry devoted to mitigating methane, mostly made up of small businesses, is ready to tackle the problem, creating jobs while cutting costs. The Obama Administration's target is absolutely achievable. Momentum on this issue has been growing at the state and federal level, and now is the time to seize this opportunity and put meaningful regulations in place. Please, issue the strongest possible national health and environmental standards to limit air and methane pollution from the oil and gas industry. Our families, communities, and children are counting on your leadership.